It&apos;s not that Mazda can&apos;t make a mid sized sedan as fun as the Mx-5. 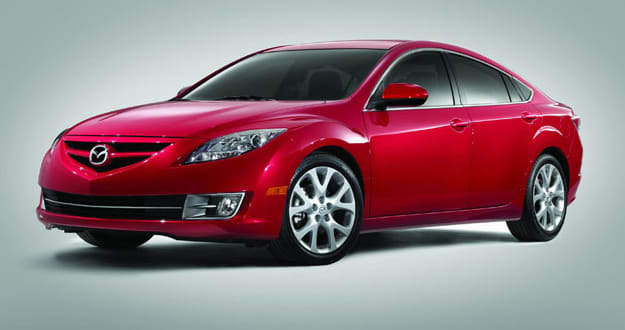 When Mazda dropped their 2.3L turbocharged I4 motor into the last generation 6, powered all four wheels and dubbed it the MazdaSpeed6, they proved they could make anything go zoom-zoom. It&apos;s just that mid sized sedans are mostly bought by parents. And all they care about is getting from the crib to the dentist to Whole Foods with the least amount of fuss. Which the 6 will do since it&apos;s now longer, wider and heavier than the last gen, meaning there&apos;s more room for people and their things. Interior materials aren&apos;t the best, but everything is ergonomically sound, so you&apos;re not wondering why you can&apos;t reach the climate controls or why you have no place to rest your elbow. Cop the Grand Touring edition and you&apos;ll find yourself in the most comfortable interior Mazda has available. But all that doesn&apos;t mean it&apos;s just a cheaper Camry. First off, the styling alone makes it more fun than its competition. Taking on more of Mazda&apos;s Nagare design theme, the 6 looks like the sedan version of the RX-8. All the wheel arches are bigger, the roof line is more streamlined and future video girls can only pray their plastic surgeons can whip them up a rear end as attractive as this. Due to the new proportions, however, any wheel under 18in will look sillier than Cassie&apos;s new haircut. Just like her head, the 6 comes in two flavors— the "i" with a 170hp I4 (inline four cylinder) and the "s" with a 272hp V6. Despite the V6&apos;s poor gas mileage (17 city/25 hwy), trust us when we say you&apos;ll be happier with that over the I4. Especially if you live in a city where the cabs are already halfway through the intersection by the time the light turns green. Or don&apos;t feel like keeping the revs up just to keep up with traffic. While the engine choices left us wondering where that sports car soul was, the suspension gave us a little hint. It&apos;s no canyon carver, but despite the light steering feel, if you whip it into a turn and the 6 won&apos;t completely turn to Jello. So, yeah, the Mazda6 is still just a midsized sedan, but at least it looks like it wants to go zoom-zoom rather than go grocery shopping.